MathWay is an iPad app that students can use to solve problems in mathematics. It is a computer algebra system capable of solving problems in basic mathematics, algebra, trigonometry, precalculus, calculus, and statistics. It is an ideal app for home works and self study. The capabilities of Mathway among others are evaluating algebraic expressions, solving equations and inequalities, and plotting graphs in Cartesian and Polar coordinates. It is also capable of calculating permutations and combinations, finding the standard deviation and variance of discrete distributions and calculating derivatives and integrals. Answers to problems can be obtained from the free version of Mathway, but step by step solutions is available on upgraded versions. Mathway is also available as an iPhone and Android apps. When GeoGebra announced the GeoGebra for iPad, I became an iPad user after a month — yes, I’m excited. Since then, I have been exploring a few apps which I will share with you from time to time. 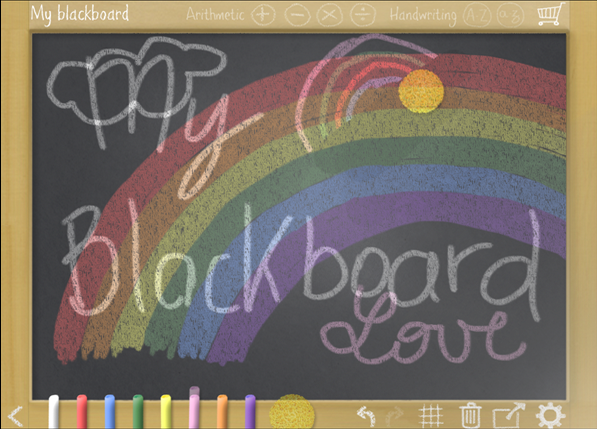 The first app that I share with you in this post is a very simple one: My Blackboard.